Eggstatic are Mesmerizing Stroboscopic Easter Egg Patterns « Adafruit Industries – Makers, hackers, artists, designers and engineers! Jiří Zemánek is on the faculty of Electrical Engineering, Department of Control Engineering, at Czech Technical University in Prague, and he assembled this fantastic video showing stroboscopic patterns on egg shells drawn using an EggBot. Various patterns are generated in Matlab using mathematical equations similar to ones describing Spirograph (or harmonograph) and Phyllotaxis. The patterns are calculated in such a way that when rotated under a stroboscopic light of suitable frequency or when recorded by a camera, they start to animate. It is kind of zoetrope— early device for animation. Eggs were painted using EggBot (designed by Bruce Shapiro as open hardware and available as a kit from http://www.evilmadscientist.com/). To draw on eggs, we used standard permanent markers and an electro kistka with bee wax followed by dying. Eggs are rotated at a constant speed, special for each pattern, by a brushless motor. No computer graphics tricks are used in the video. The Original Egg-Bot! – Deluxe Kit! 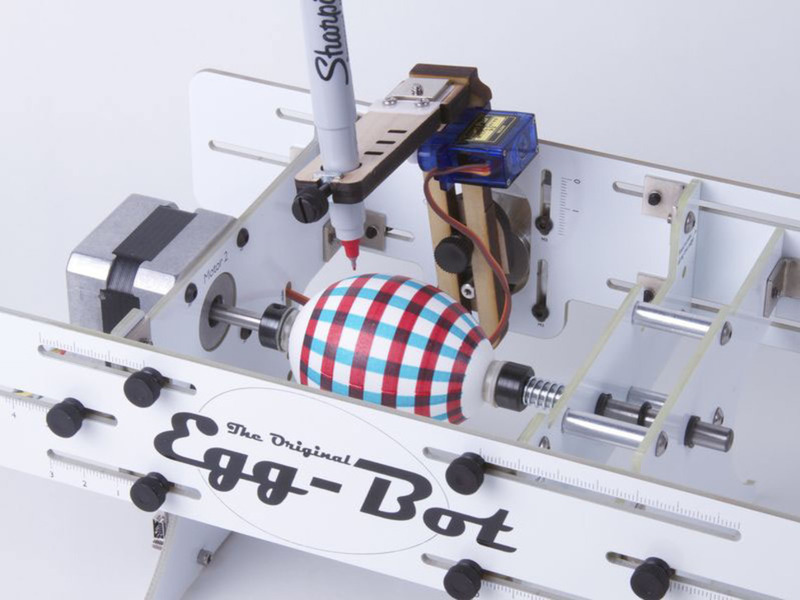 : The Eggbot is super adjustable, and is designed to draw on all kinds of things that are normally “impossible” to print on. Not just eggs but ping pong balls, light bulbs, mini pumpkins, and even things like wine glasses– with a bit of work. See the photos above for some examples of personalized golf balls, christmas ornaments, light bulbs, and (yes) eggs. Read more.